Every other year or so, Glock introduces a "collectors item" colorized Glock handgun. These are made very rarely, in a limited supply and are only available until they are sold out. Yes, you can purchase a new Glock handgun on this website and have it shipped to a FFL dealer in your area. Then, you will need to go to that dealer and fulfill the local and state requirements necessary to own a handgun at which time you can take delivery of your Glock. Here at GlockStore, we hopped on a small inventory to take care of our ardent collectors. 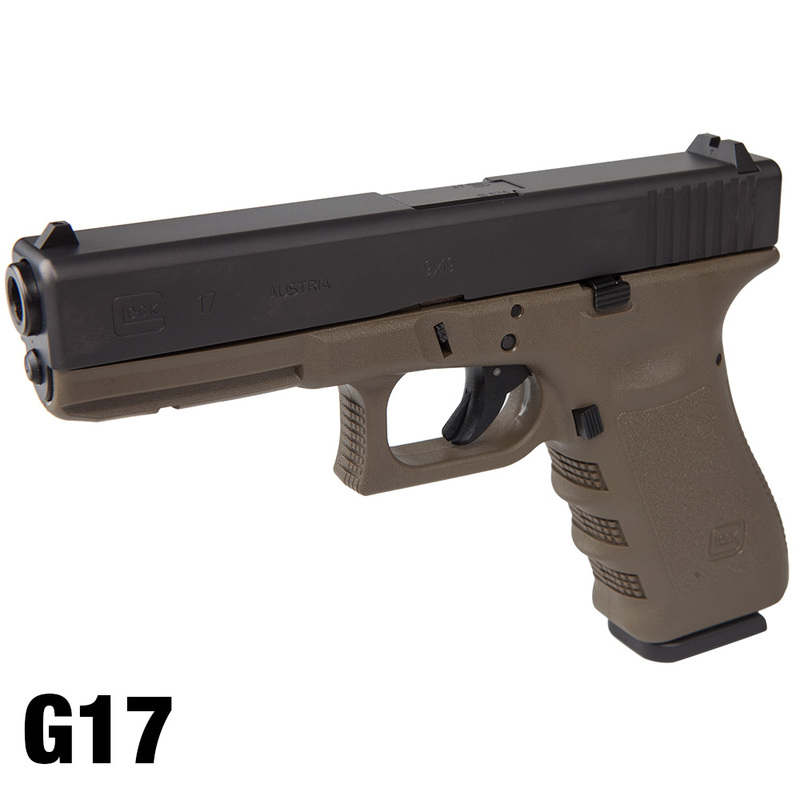 Please, if you have an interest in this new Olive Drab Green Two Tone Glock, call our office now or order it online. It is certainly a collectors item and will remain so for years to come. We can customize and install parts for you at no charge and ship the gun fully assembled and ready to shoot. Just add the parts to your shopping cart and please make a note in the comments section providing us with any details or special requests. All factory parts will still be sent with your Glock purchase. If you have any questions, feel free to contact us. No discounts are available on the purchase of Glock factory handguns. Discounts will only apply to accessories and parts. NOTE: FFL required for shipment. If you do not have a dealer in mind we can help you find one in your area. If you do have a dealer selected, you must note which FFL will be receiving this item in the Comment box during checkout. Failure to do so could delay your order processing and shipping. If your FFL is not already on file, have them fax a signed copy of their license to 858-569-0505 and include your name and order number on the cover sheet. See i bought a Glock 23 GEN4 awhile ago in the 2-tone black and dark earth. But also replaced everything on it and in it. Love my glock pyramid trigger but noticed you have a new one out so im debating on switching it out. I love the way it fires now and it looks good with the gold look to it. You can never go wtong with a Glock. Looking into getting the new 19!